A few weeks ago, I received an email from Trina Morgan of Beautylicous Reviews saying I had won her giveaway. I was so excited - it was the first time I have ever won any giveaway. And, the prize was a BH Cosmetics palette. Perfect for my not-so-comprehensive eyeshadow collection. Unfortunately, she found that the BH palette wouldn't ship internationally. But she was so sweet about it, sent me a $25 gift card and told me to buy whatever I wanted. I nearly went ballistic with all the makeup goodies and spent about three days narrowing down my choices, finding out who would ship internationally. I wanted to get a palette, since that was the whole point of the giveaway. I was about to choose between a Too Faced natural palette and a Coastal Scents palette, but casually glanced towards "Customers also bought". 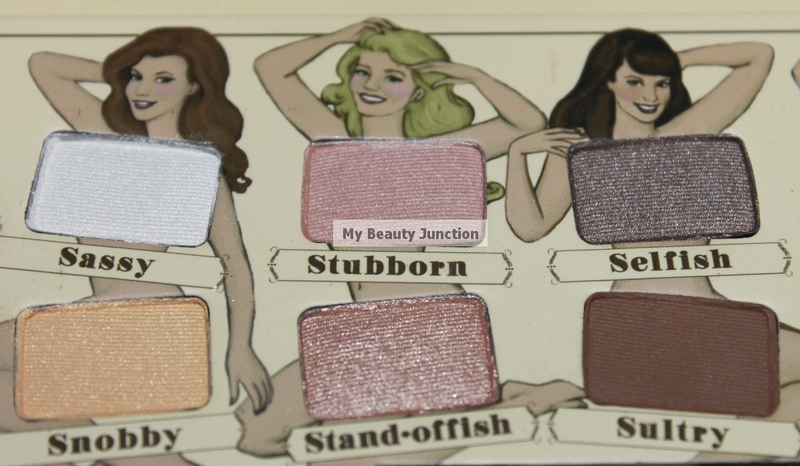 Then, I saw it - TheBalm's N*de'Tude palette. After treating myself to the Balm Jovi palette from TheBalm website launch 50% flat off sale, I cannot tell you how fabulous their shadows are. I was so thrilled to find an original N*de'Tude palette (here's how to spot a fake) and I put in an extra amount to cover the shipping, and the palette arrived today. Sorry for the shadow on the lower half. I didn't realise that the lid was half open and the light was behind. The shades are named Sassy (shimmery white), Snobby (shimmery yellow gold), Stubborn (a peachy pink), Stand-offish (pinkish bronze), Selfish (a beautiful shimmery taupe), Sultry (matte medium brown), Sophisticated (shimmery deep brown), Seductive (shimmery golden-brown), S3xy (deep matte burgundy), Silly (deep brown with maroon and copper glitter), Serious (matte black) and Sleek (matte black-brown). The double-ended brush is quite good for a palette, when you consider the quality of brushes generally enclosed. One end is similar to TheBalm's Shady Lady brush, good for lining. The other is dense-but-fluffy, good for base and contour. I have done a preliminary finger-swatch. The shades are silky and buttery and the pigmentation is insanely opaque, even the matte shades, without primer. No fallout noted, except with the glittery Silly. At first glance, my favourite shades are Standoffish, Selfish, Seductive, Sophisticated and S3xy. For those who want swatches, they will come up soon. Maybe a comparison post with the ubiquitous Urban Decay N@keds. Once I get my fill of just looking at this palette.